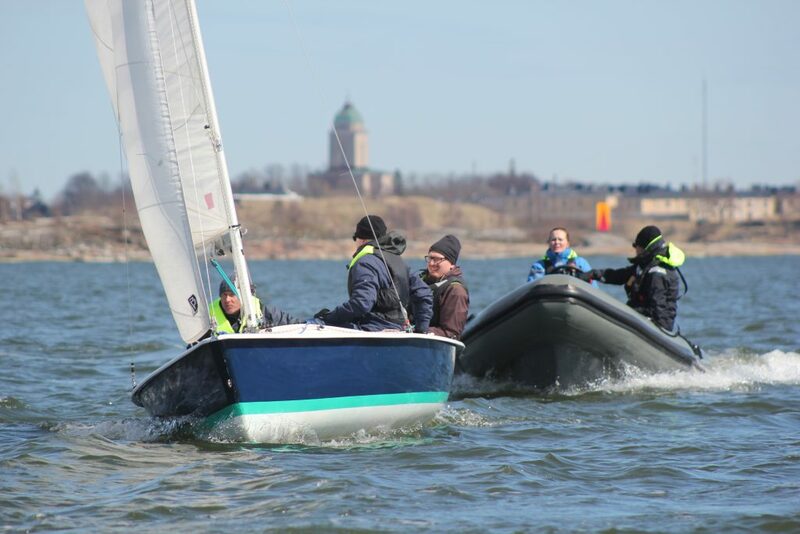 Interested in sailing in Helsinki? Training for adults in the HSS Sailing Center provides excellent training and atmosphere for sailors for all levels. 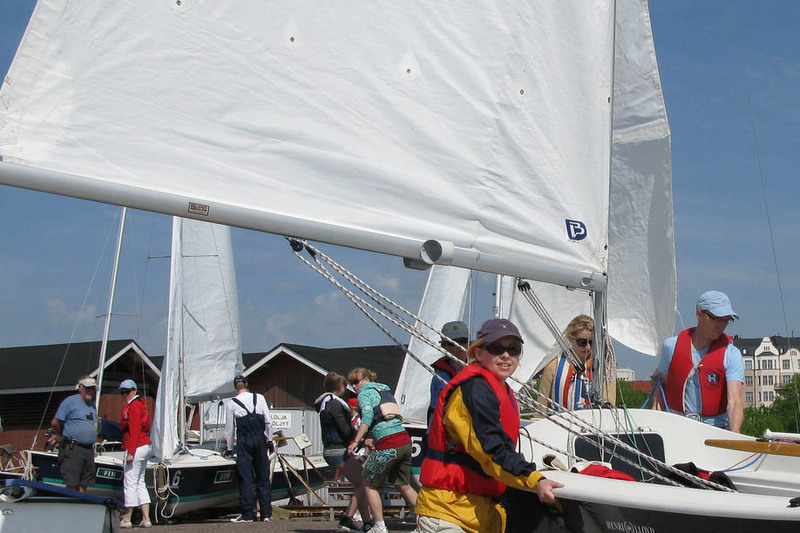 From adult beginner sailing courses to instructed sailing and competitions. A fleet of several different classes of boats is at member’s disposal. Come join us! Kiinnostaako kilpapurjehdus tai purjehduskurssi? Aikuispurjehdus HSS:n Sailing Centerissä tarjoaa erinomaista opetusta sekä omistautuneen harrastusporukan kaikentasoisille purjehtijoille. Tarjontaan kuuluu purjehduskursseja aloittelijoille sekä ohjattuja treenejä ja kilpailuja. Jäsenemme voivat purjehtia useilla eri tyyppisillä veneillä. Tule mukaan! HSS Sailing Center is a committee under Helsingfors Segelsällskap -sailing club. Sailing Center organises adults sailing courses, training, lectures, races and much more. The sailing season starts in April with first “talkoo” when all Laser 16 and Elliott 6mr boats are fixed up for sailing. At the end of April, the first beginner’s weekend course will be organised and the first brave ones will be training on the water. In May starts the actual sailing season. HSS Sailing Center offers three different classes of boats and trainings tailored for all experience levels. There are plenty of learning opportunities for both beginners and experienced racers. The season continues till the end of October including different kind of clinics, races, parties, talkoos and so on. At the end of October, it’s time to lift all boats and start planning next season. 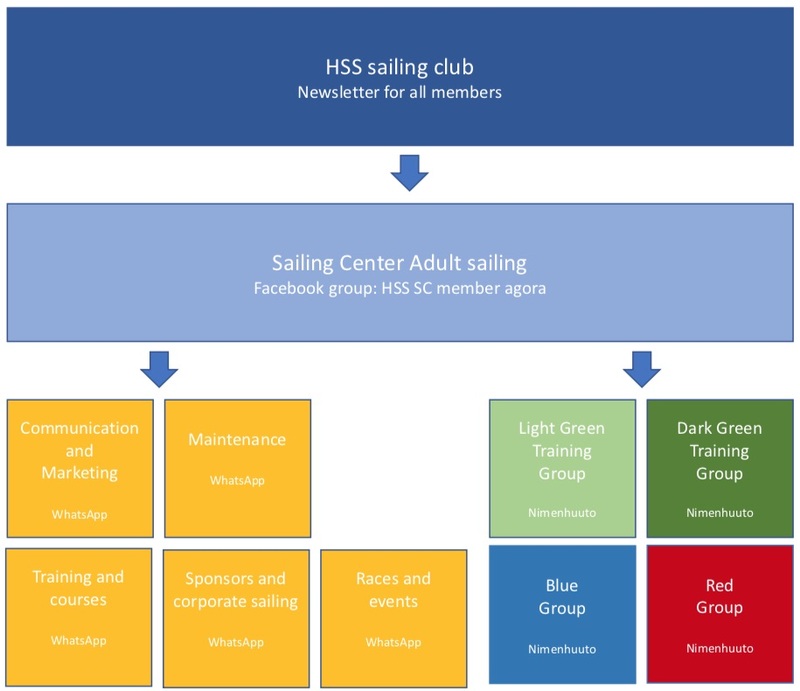 In season 2018 HSS Sailing Center had about 70 members. The core of HSS Sailing Center is the Sailing Center community which means our members – people who want and can make things happen together. Being part of the community means participating, learning, doing together and having fun – and of course sailing. Sailing Center works mainly on a voluntary basis so everyone’s input is important. What is HSS Sailing Center? How does the season 2019 look like? What kind of training groups there will be? What is the price? And schedule? What about races and events? Find out more about this event on Facebook! Open Island 2019 (Try Out Day) will be organized on 19th of May 2019. Suitable for all ages! We will have the famous welcome event on the 25th of May 2019. Open event for all! This will be the perfect start of the season! Additional information on the following pages. Want to become HSS Sailing Center member? The season 2019 beginners’ courses in sailing are available! Book your spot for a course and learn the basics of sailing. Every year we have multiple different nationalities represented, so feel comfortable joining in even you don’t speak a word in Finnish. During the weekend we will focus on both sailing theory indoors and sailing basics on land in a simulator and in water as existing weather conditions allow. After the course, you have learned the basics of sailing and rigging of the boat. If you choose to join the Sailing Center you will then be ready to take part in our coached beginner trainings. This course is held using our Laser 16 dinghies that are sailed with a crew of 3-4 persons. Crews are formed of the participants of the course. All courses have the same content. Participation fee to a course is 300 €. For a HSS member, the fee is 200€ (ask the discount code by e-mail or phone). Sign up closes seven day before the course starts. Late sign ups must be separately asked from the coach by e-mail or phone. If there are free spots on the course you can join, but here will be extra 20 euros cost. You can find coaches contact information here. You have an option to join the Sailing Center during or right after the course, in which case you will receive a discount of €100 from your training fee (575€ → 475€). Suositut purjehduksen alkeiskurssimme järjestetään jälleen kaudella 2019! Varaa paikkasi viikonloppukurssilta ja opi purjehduksen perusteet hyvässä seurassa. Kurssi on avoin kaikille, ja sinulla ei tarvitse olla aiempaa kokemusta purjehtimisesta. Viikonlopun aikana keskitymme purjehduksen teoriaan sisätiloissa, purjehduksen perusteisiin maalla simulaattorin avulla, sekä merellä jos sääolosuhteet sallivat. Kurssin jälkeen olet oppinut purjehduksen perusteet ja veneen valmistelun purjehdusta varten. Intensiivinen viikonloppukurssi on hyvä tapa tutustua purjehdukseen! Koska purjehdimme 3-4 hengen L16 jollaveneillä, kurssi sopii hyvin myös niille, joilla on jo jotakin kokemusta isommista veneistä, mutta haluavat oppia veneen käsittelyä ja kipparointitaitoja. Jokaisen kurssin sisältö on sama. Ilmoittaudu mukaan täältä! Kurssin hinta on 300 €, tai 200€ HSS:n jäsenille (pyydä alennuskoodi puhelimitse tai mailitse). Mikäli liityt Sailing Center jäseneksi kurssin jälkeen, saat 100 euron alennuksen kauden harjoitusmaksusta (575€ → 475€). Sailing Center organizes approximately 19-21 weeks of training during a season. Weekly trainings are included in the training fee. Laser16, Light Green, Beginners group: Basics of sailing, preparation & maintenance of a boat. Chill out sailing, for those who wanna sail only every now and then. Starting at the beginning of June, sailing on Tuesdays. Laser16 Dark Green, Beginners group: Basics of sailing, preparation & maintenance of a boat, basics of racing. For those who wanna train regularly and participate in training every week. Starting at the beginning of May, sailing on Mondays. Elliott, Blue, Intermediate group: Fleet-racing, tactics, trimming, wind tactics. Starting at the beginning of May, sailing on Thursdays. Elliott Red, racing group: Fleet-racing, more challenging manoeuvres, boat handling and rules tactics. Starting at the beginning of May, sailing on Tuesdays. Saturday training: mixed training for all sailors, everyone welcome! See a more detailed introduction of groups here. It is recommended to start trainings with one group which corresponds your sailing skills level. After a few sessions, it is possible and even recommended to try out other groups and boats too. Our coaches are more than happy to help you to find the right group! You can find coaches contact information here (link). Weekday trainings starts at 17.30 for all groups (boat (rigged) and crew ready to go sailing). Beginners groups (green) start at 17.30, crew ready to go sailing, clothes changed etc, but no need to have boats rigged yet. Saturday trainings start at 11.00. Training takes about 2,5-3 hours. It’s recommended to arrive 30-45min before a coached trainings. Boats should be prepared before the start of the training session. During Autumns coached trainings starts earlier due to darker evenings. Please check the time from your coach or with an email from sailingcenter@helsinkisailing.com. You can see schedule in calendar format under CALENDAR -section. 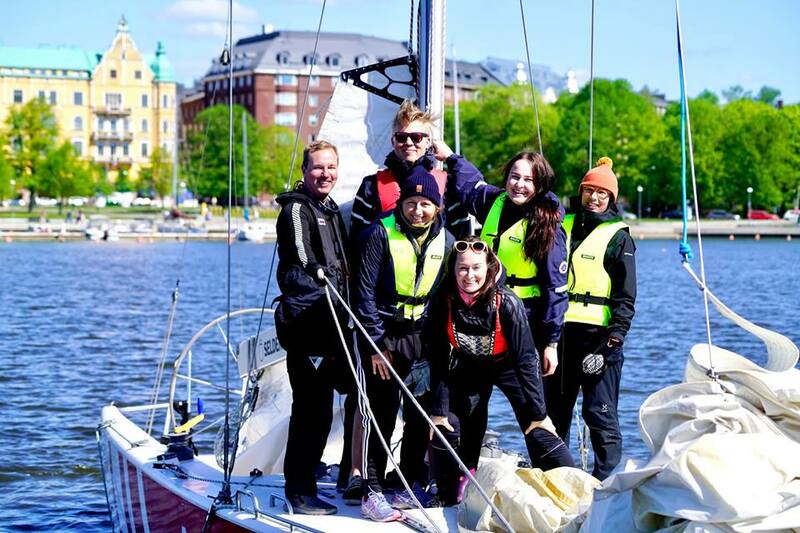 If you are not sure which group would be suitable for your level and interest: ask directly from the coaches, ask from Facebook Agora-group, or send an email to sailingcenter@helsinkisailing.com. We will find it together! You don’t need any special gear to start sailing at HSS Sailing Center. For your own comfort, bring weatherproof clothing, proper shoes (e.g. trainers) and sailing gloves (gardening gloves with good grip is a good option!). It would be good to have your own life jacket but there are life jackets on the island that you can borrow in the beginning. In case you want to invest in own sailing clothing, feel free to ask other members for great tips on what and where to buy. There are a few shops in Helsinki Lauttasaari and many good web stores, for example in England. HSS Sailing Center will borrow you a life jacket on Beginners Course. On coached trainings own lifejacket is needed. 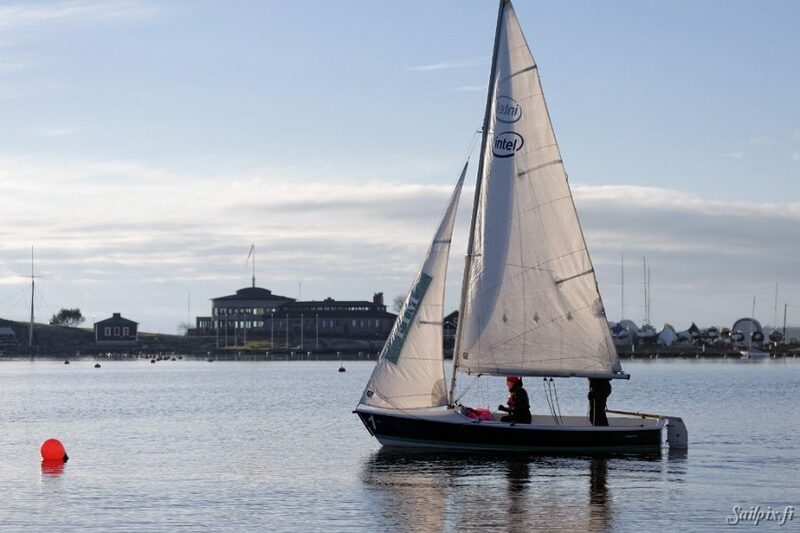 ”Skipper rights” term means that you have the right to skipper a boat outside coached training. You need to have skipper rights if you wanna participate on races and regattas or just wanna go sailing by yourself. You need to apply for the rights for all the classes separately (Laser16, Elliott, SM40). Normally members start with Laser16 rights, then move to Elliott rights and finally to SM40 skipper rights. How to apply for skipper rights? To apply for the skipper rights you need to have your coaches recommendation or then show your skills on the special ”practical examination” -event. If you do have a recommendation from the coach you can just fill up a form (link). If you don’t have a recommendation from the coach, but you think that you handle all the skills required for the skipper rights, you can apply for the practical examination by another form (link). After filling up a form you will get skipper rights or get an invitation for the practical examination. Concretely skipper rights mean that you will get username and password for the boat booking -system (link) and you are able to book boats. I am familiar with how to use the boats and acknowledge that as a Skipper I am expected to be at a level where I am able to sail with a crew of inexperienced sailors in the given boat type. The Skipper agrees to look after the boat he or she is using on behalf of his or her own actions and his or her crews’ actions and guarantees that the boat is being used in accordance with the applicable rules, regulations and orders issued by HSS SC. HSS SC is responsible for ensuring the boats. The insurance covers damages to the skippered boat and damages to third parties (property damages up to 255.000 EUR and personal damages up to 510.000 EUR). Damage is predominantly understood as damage to the boat or its togs that are the result of an accident. The liability does not extend to wear and tear that is the result of normal use. Lasers and Elliots 420 EUR. If an incident happens during guided training, HSS shall be liable for the damage. If an incident happens during beginners’ course, Open island 2019 (try out day), corporate sailing or talkoo, HSS shall be liable for the damage. If an incident happens outside guided training, e.g. during Wednesday races or when a Skipper has taken a boat at other times, the Skipper shall be liable for the damage. If the insurance does not cover the damage, either a) the Skipper or b) HSS shall be liable for the whole damage (i.e. Skipper or HSS shall pay the costs related to the damage) depending on the time and place of the incident (see different alternatives above). The aforesaid division of liability based on the time and place of the incident shall not be applied to if the Skipper acted intentionally or in gross negligence or the skippered boat has been used contrary to the terms of this Agreement. In these cases, the Skipper shall always be liable for the caused damage. Skipper is required to fill a sailing report after each sailing session (available on the HSS Adult Sailing website). Skipper shall not assign the right to use a boat to a third party. Skipper may neither assign this Agreement as a whole or any parts of it to a third party without prior written consent from HSS SC. If the Skipper violates the terms of this Agreement HSS MRC may immediately terminate the Agreement. This Agreement does not automatically grant the Skipper the right to skip the selected boats and granting these rights is subject to HSS SC consideration and approval. I hereby assure to have read this Agreement, HSS SC rules for boat usage, rules for permitted sailing areas, as well as all other HSS SC instructions, and to adhere to those terms, rules and instructions. What if there happens damage while sailing? Read here (link) how the damage process works. The club owns six Elliott 6m boats. The Elliott 6m is an Olympic-class keelboat, designed by New Zealander, Greg Elliott. 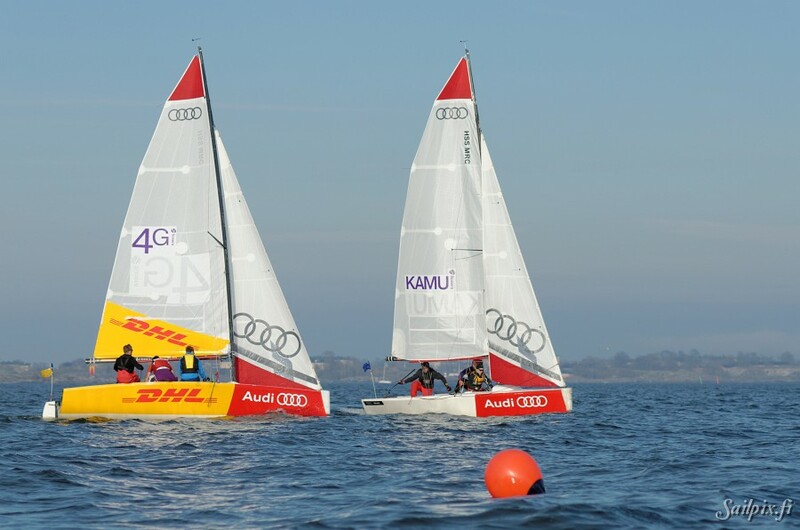 It was selected for the women’s match racing event for the 2012 Olympics. The Elliott 6m carries a spinnaker pole and symmetric spinnaker which is considered more suitable for match racing. 3-4 persons can sail Elliott boat. Urheilullinen vene purjehtia. Uusiseelantilaisen Greg Elliotin suunnittelema vene on 6 metriä pitkä ja painaa 635 kg. Kolmen purjehdittava Elliott on suunniteltu match race -mielessä ja vene valittiin naisten Match Race -olympialuokkaan 2008. 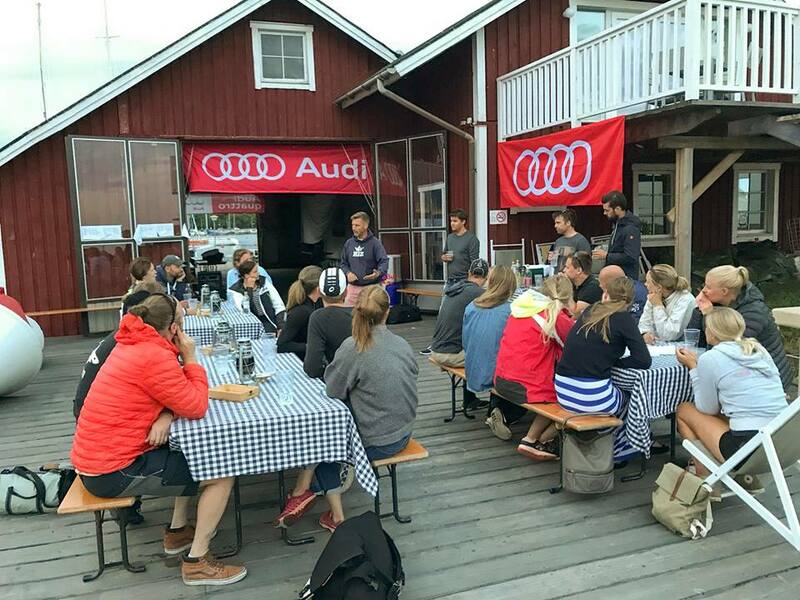 Audi Match Race Suomen tiimi kipparinaan Silja Lehtinen, edustaen sekä HSS:ää että NJK:ta, otti pronssia Lontoon olympialaisissa 2012. Tiimi ja heidän harjoitusvastustajansa käyttivät Audi HSS Sailing Centerin veneitä valmistautuessaan vuosina 2009-2012. Veneet ovat edelleen hyvin aktiivisessa käytössä. Club owns nine L16 boats. Five metres in length with a 2m beam, the gel-coated glass fibre dinghy first appeared in 1986 under the ’Laser Weekend’ tag which signalled the sort of family-and-friends market it was aimed at. A retractable 29.5kg metal centreboard makes a significant contribution to the overall 250kg hull weight and to the boat’s feeling of solidity and stability. It has a sizeable watertight storage locker under the enclosed foredeck, accessible via a liing hatch on the forward bulkhead. Buoyancy is built into the bow and enclosed side decks, while the cockpit is self-draining via holes in the full-height transom. Production of the Laser 16 ceased in the late 1990s but it is still very popular with families and day cruising aficionados, and can easily accommodate five adults. L16 have a jib, mainsail and spinnaker. Hyvä vene purjehduksen perusteiden opetteluun. Vene on suunniteltu 1989, se on 5 metriä pitkä, 250kg painava, ja kolmen tai neljän hengen purjehdittava. Se on suosittu harjoitusvene monissa purjehduskouluissa, sillä se on melko helppo purjehtia, mutta mahdollistaa taitojen kehittämisen korkealle tasolle. If you want to attend trainings, you need to pay an annual HSS Sailing Club membership fee* and annual training fee. With your personal membership card, you are entitled to membership benefits. The most important benefit is that you can take the Liuskasaari ferry for free. Other great benefits include discounts on food and drinks in Restaurant HSS Paviljong and Skiffer and use of the HSS islands of Andö (Inkoo) and Getören (Porvoo). *HSS is a Sailing Club with several divisions focused on different sailing activities including junior sailing, adult sailing, and classics. 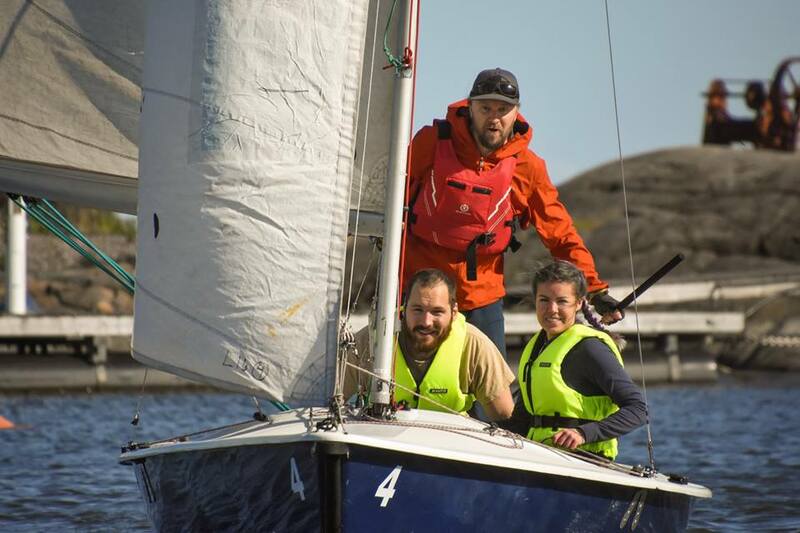 Sailing Club members are covered with Finnish Sailing and Boating association insurance and that’s why membership of the club is obligatory. HSS is a sports club, not a commercial company. The club works mainly based on voluntary. Everyone’s input is important and all the members must either participate on voluntary or pay for the organizing work. There are many things to do and even a small contribution is valuable! Voluntary is also a great way to get to know other sailors and find new sailor friends. 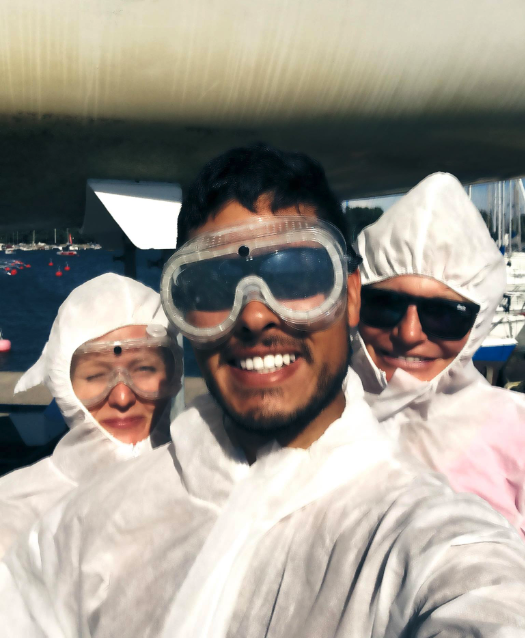 At HSS Sailing Center (adult sailing) every member must participate at least 14 hours of talkoo work and take part and choose one task in some of our five volunteer commissions. Tasks are very different and everyone will, for sure, find an interesting task for him or her self. All tasks are counted as 10h of voluntary work to keep this simple. 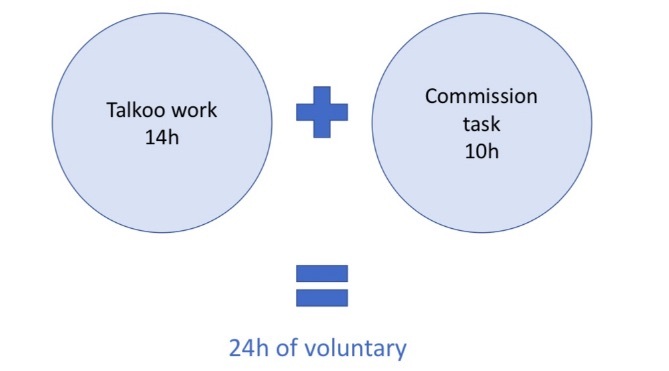 At the end of the season, all members should have collected 24 hours of voluntary. Communications and marketing: maintaining member register and application form, marketing all courses and training groups, updating social media accounts and web page, reading and answering e-mails and maintaining Holvi web store. Races and events; organizing all events: info evening and welcome event for interested new members, Wednesday races and after sails, full day regattas, parties and barbeques etc. Maintenance; taking care that all the boats are in good sailing condition: organising maintenance talkoos and preparing “to do” -lists, ordering bigger maintenance jobs from professional boat fixers, maintaining spare part and tool container. Sponsors and corporate sailing: finding sponsors to buy for example new sails and selling corporate sailing events for companies and partners. Every commission has a task list. Every member must choose one task from the list. Two persons can share one task. Older members and Rosa, our Manager Coaching and Sail Training, will help new members so that everyone can manage their task. We have a lot of info and instructions from the past years, so there is no need to “re-invent the wheel” all though new ideas and updates are very welcome! After signing up you will be contacted and get instructions on how to choose a task. All the tasks are counted as 10 hours of voluntary to keep this simple. Talkoo points and commission tasks are followed and for those who do not do their part the fee is 470€. At HSS Sailing Center you can practice racing in many ways. The tradition of the Wednesday races started at HSS before the second world war! Races are open for all club members and for several boat classes, including L16, Elliott 6m and SM40. Laser16-boats are the most used ones. After the race, there’s an after-sail on the island. As there will be no coach to assist with the boats, you will need to have qualified skipper with skipper rights in the boat. Before being qualified to skipper your own boat, you are warmly welcome to join the Wednesday races as crew or joining the organizing team. Keep an eye on the HSS SC member agora in Facebook for crew spots. Spring Cup and Autumn Cup are fleet racing events sailed by Elliott boats. Spring Cup is organized in June and Autumn Cup in August. Both events are two days regattas and open for all HSS members as well as for teams from other clubs. There will be 3-6 races per day. Collect your team and join! More info you can find here. This regatta is organized middle of October and its great way to end the season. Sailors will compete in 4-6 races during one day. The regatta is sailed with Elliotts and fleet racing format. It is open for all HSS members and after the race, you can join in the traditional crayfish party. Follow HSS Sailing Center on Facebook for more info. Last race of the season! 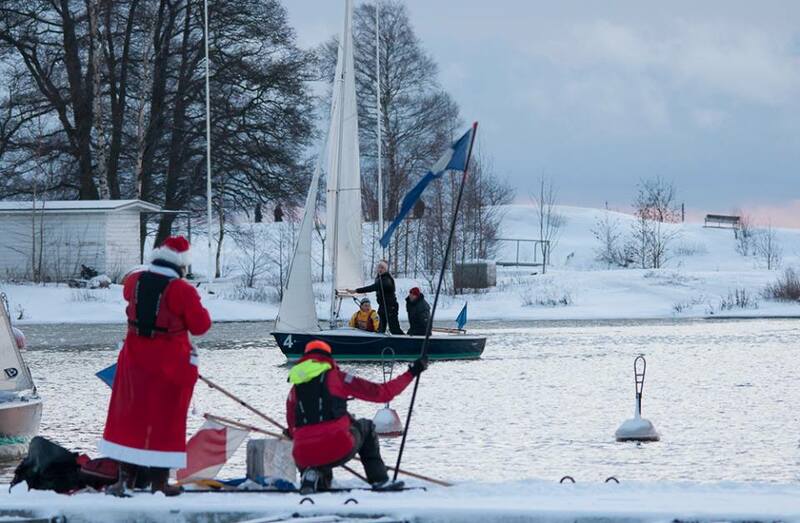 This fun event is sailed every year after Christmas on 26th December. After spending a few days with family and friends is good to go out and see some sailor friends. The regatta is sailed with Laser16 boats in match racing format. Jäsenyys Audi HSS Sailing Centerissä on paljon enemmän kuin vesillä vietetty aika. Kuten kokeneemmat purjehtijat tietävät, yllättävän suuri osa harrastuksesta tapahtuu mailla – veneiden perään katsominen, niiden valmistelu purjehdusta varten, välineiden laittaminen takaisin paikoilleen treenien jälkeen. Jos olet aloitteleva purjehtija, tulet tutuksi sen kanssa, mitä veneiden ylläpito purjehduskuntoisena vaatii ja miten veneet toimivat. Ja kun asioita tehdään yhdessä, se on myös hauskaa! Purjeveneisiin hurahtaneille seura tarjoaa iloksi myös Suomen suurimman klassikkoveneistön. 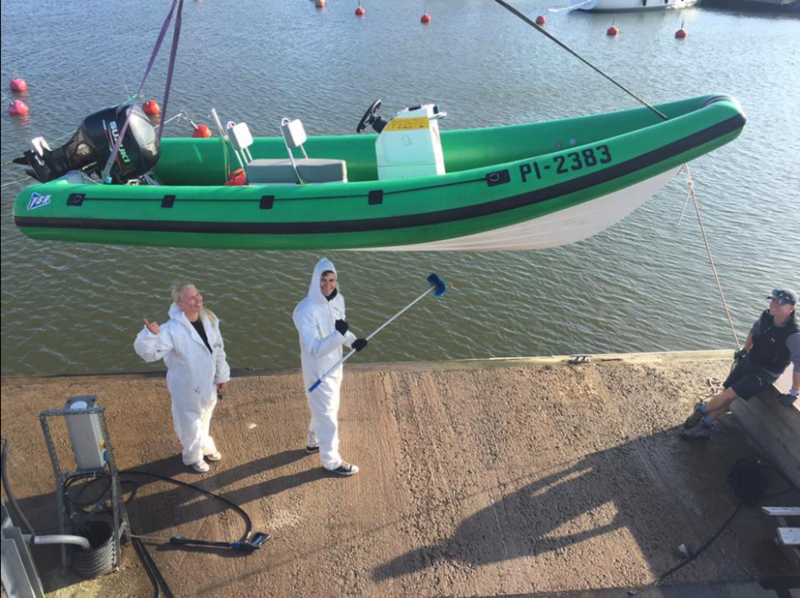 Sen lisäksi, että ne ovat upeita, ne ovat todellinen nautinto purjehtia, ja monet niiden kippareista ovat toivottaneet Sailing Centerin jäseniä tervetulleiksi osallistumaan purjehduksille ja kilpailuihin. The Sailing Center’s Winter Program offers lectures and reading classes for all HSS members (not just Sailing Center members). The program starts at the beginning of February and continues until mid of April. The program will be held in Liuskasaari, at the club’s main building “Klubihuone”. 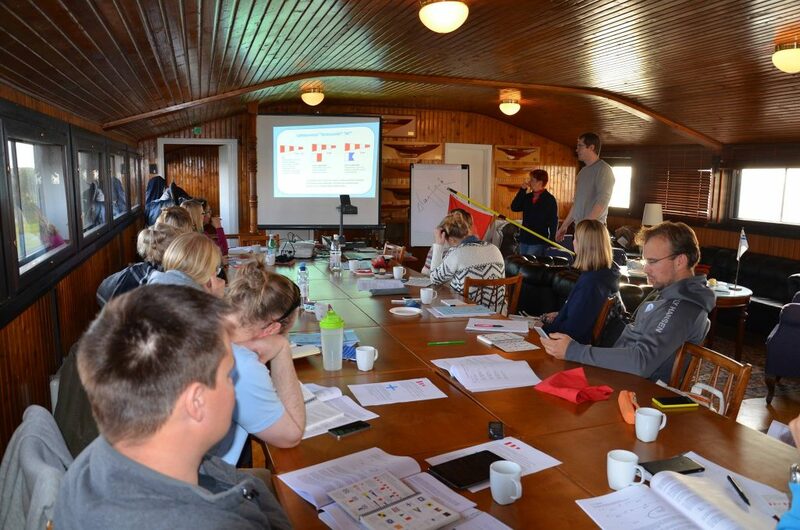 The main focus of the program is to learn all the skills needed for “Saaristolaivuri” -diploma organized by the Finnish Navigation Association. The program includes six reading classes, during which you are practising degree-related skills. The goal is to take the exam on 12th April 2019. More information about the “saaristolaivuri” -diploma below. Also, various lectures and workshops are organized about topics that members have wished. Below you will find a program. There may still be changes on the program because not all dates are fixed with the speakers. The reading classes are free, but some of the lectures may be chargeable. More info will be updated to the club’s website and Facebook. The program starts every week at 18.00. Sailing Centerin talviohjelma tarjoaa kaikille seuran jäsenille (ei vain Sailing Centerissä harjoitteleville) erilaisia luentoja, lukupiirejä ja yhdessä oppimista purjehdukseen liittyvissä taidoissa. Ohjelma järjestetään helmikuusta huhtikuuhun Liuskasaaressa, seuran päärakennuksen tunnelmallisessa Klubihuoneessa. Ohjelman pääfokus on Suomen Navigaatioliiton järjestämän Saaristolaivuri -tutkinnon suorittamisessa. Ohjelma sisältää kuusi lukukertaa, joiden aikana harjoitellaan tutkintoon liittyviä taitoja. Tavoitteena on osallistua 12.4.2019 tutkintotilaisuuteen ja suorittaa tentti. Lisätietoa tutkintoon liittyen alempana. Tämän lisäksi järjestetään erilaisia luentoja ja työpajoja jäsenten toivomiin aiheisiin liittyen. Alta löydät ohjelman. Ohjelmaan saattaa tulla vielä muutoksia, koska kaikkia puhujia ei ole kiinnitetty. Lukupiirit ovat ilmaisia, mutta osa luennoista saattaa olla maksullisia. Lisää infoa päivitetään seuran sivuille ja Facebookiin. Ohjelma alkaa joka viikko kello 18.00. Saaristolaivuritutkintoi antaa perustiedot ja -taidot turvalliseen liikkumiseen sisävesillä ja saaristossa. Noin 30 tuntia kestävään kurssiohjelmaan sisältyy mm. Suomen Navigaatioliiton tutkinto on valtakunnallinen.